O-NOTARE O-MIDARE BA in NIE. O-HAKO GUNOME-MIDARE. SUNAGASHI. HAMON can be FUKASHI. KUNIHIRO TEN-SHO to KEI-CHO (f: KUNIMASA): TANAKAKINTARO. SHIMOTSUKE Although the origin in the Mei states Kyushu Hyuga. It is from this time, the TEN-SHO, he established "HORIKAWA"
He was a long time retainer for the Ii Family. Running ITAME with JI-NIE. MASAME in the SHINOGI-JI. resemble that of his father. -Early: SUGU GUNOME, GUNOME-MIDARE in tightly held NIOI. 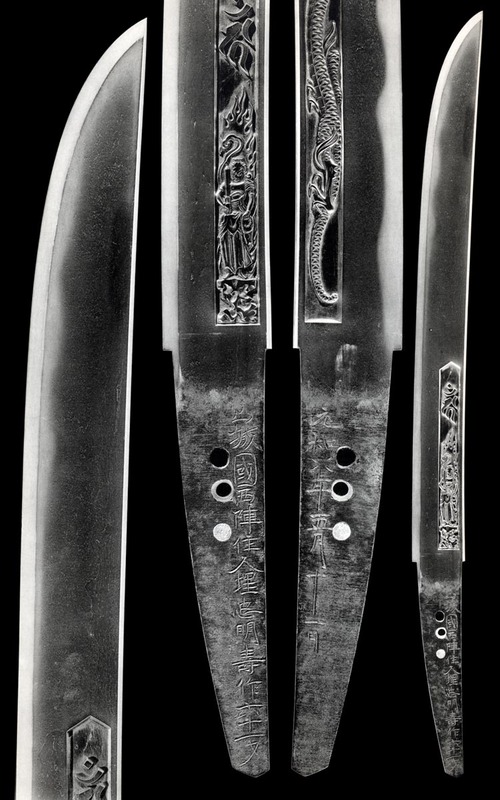 Shinogi-Tsukuri, Ihori-Mune, slight Sori to elongated Chu-Kissaki. Tachi-Omote Bo-Hi with a frame holding a Standing Boji and Fudo. Tachi-Ura has Bo-Hi and a frame holding Kurikara Dragon. Ko-Itame Hada with Masame that stands has Ji-Nie and some Chikei. Ko-Notare in tight Nioi and Ko-Nie shows some Sungashi. Midare-Komi Boshi with Togari on Omote and Hakikake on Ura. 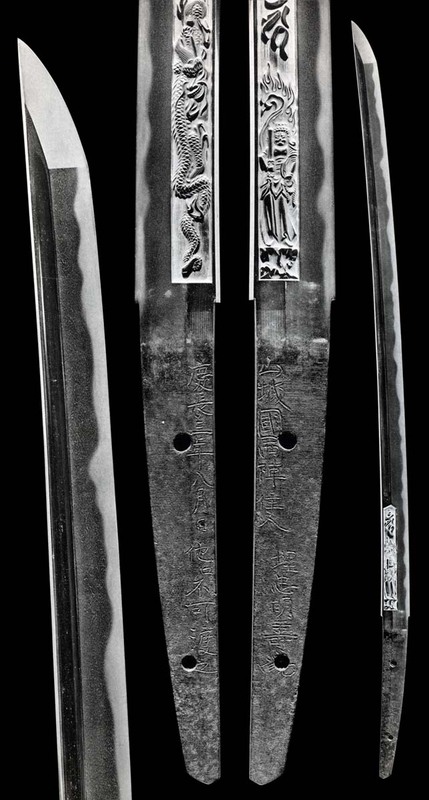 Omote Katakiri-tsukuri, Ura is Hira-Tsukuri. 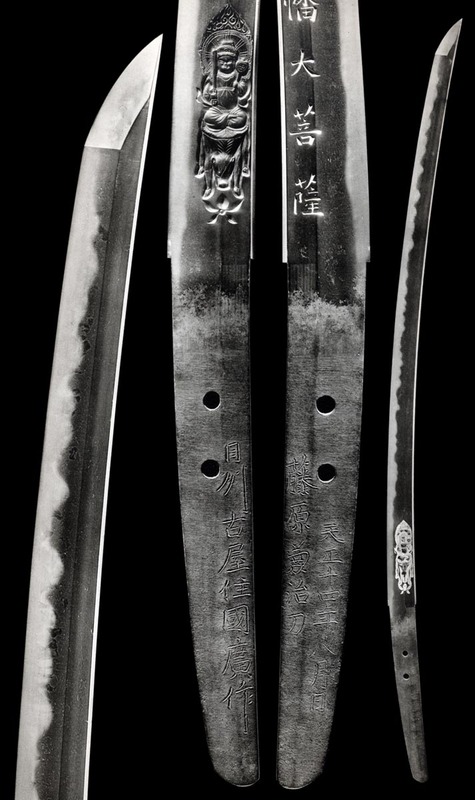 Mitsu-Mune, wide blade with shallow Sori. Raised Bonji and Fudo in a frame on Omote and Flaming Tama with Kurikara chasing on Ura. Gentle Asaki-Notare wherein a subtlety of Ko-Gunome Ba becomes more complex in the mid. Notare-Komi Boshi is Ko-Maru Kaeri. Ubu Nakago is Yamagata-Jiri with one Mekugi-ana. Katakiri, Omote and Hira-tsukuri, Ura. Wide blade with slight Sori. Standing Ko-Itame Ko-Mokume Hada that runs to Masame along the Mune. There is Ji-Nie. Ko-Notare of Ko-Gunome with Ashi-iri that becomes wider in the upper. Clear Nioi and Ko-nie. Sunagashi streams through figures. Ko-maru Boshi has Fukashi Kaeri. Ubu Yamagata Nakago has three Mekugi-ana, one lined and one filled. Gift to Shrine. Ken with single Hi on the Shinogi, both sides. Ko-Itame Hada with thin Ji-Nie. Very slightly Asaki-Notare Suguha where the upper widens. Nioi is lush and the upper is bathed of Nie-Deki. Notare-Komi Boshi that is Tsuyo - strong. Kurijiri Nakago has one Mekugi-ana and signed in his familar broad strokes. Running Ko-Itame with Masame Hada has Ji-Nie. Chu-Sugu Ko-Midare Ba in tight, clear Nioi and an always insisting Nie-Deki Habuchi. Hamon rises to Hiro-width in the Monouchi where Tobi-Yaki stands out. Asaki-Notare Hiro-Sugu Boshi has Ko-Maru. Ubu haagari Kurijiri Nakago has one Mekugi-ana and signed above across the Shinogi. 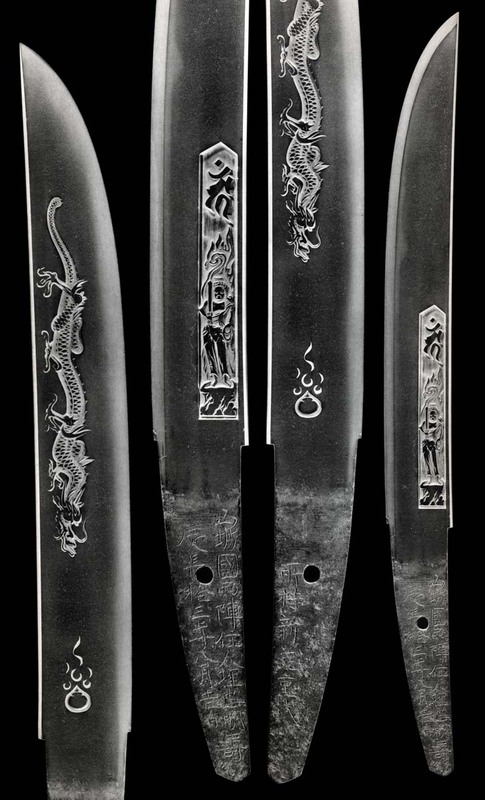 Tachi-Omote: Bo-Hi, Tsume "Claw", Bonji and Fudo with Tama Jewel. 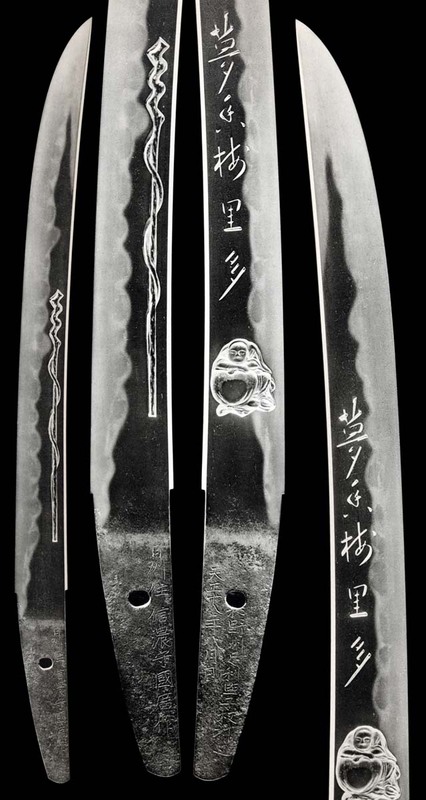 Tachi-Ura: Bo-Hi to Tsume "Claw" Bonji and Bu-un Chokyu. Notare Hamon line rises high in the upper and lower but is calm through the mid. Gunome-Midare Ba has Togari and Tobi-yaki pushing along and through the Habuchi into Nijuba like forms. 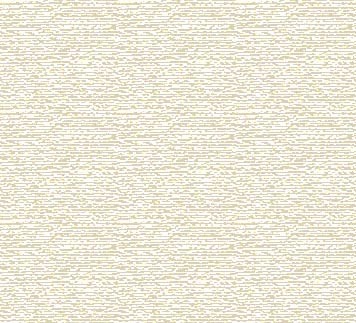 Clear Nioi-Fukashi where Nie becomes Ara-Nie. Moto terminates with long Yakidashi. Gunome Tobi and Tama continues into a nearly full Boshi that falls against the Mune. Ubu Yamagata Nakago. two Mekugi-ana. Hira-Tsukuri, Ihori-Mune, gentle Niku and shallow Sori. Omote: Bonji, TaiHi Ta MonTen and Rendai. Running Ko-Itame Hada to Masame along the Mune. there is Ji-Nie. An energetic Notare holds Gunome-Midare Ba with Ashi and Yo in Ko-Nie and clear Nioi. There are Tobi-yaki. Midare-Komi Boshi with Maru and Fukashi Kaeri-naga. Haagari Kurijiri Nakago is Ubu with one Mekugi-ana. 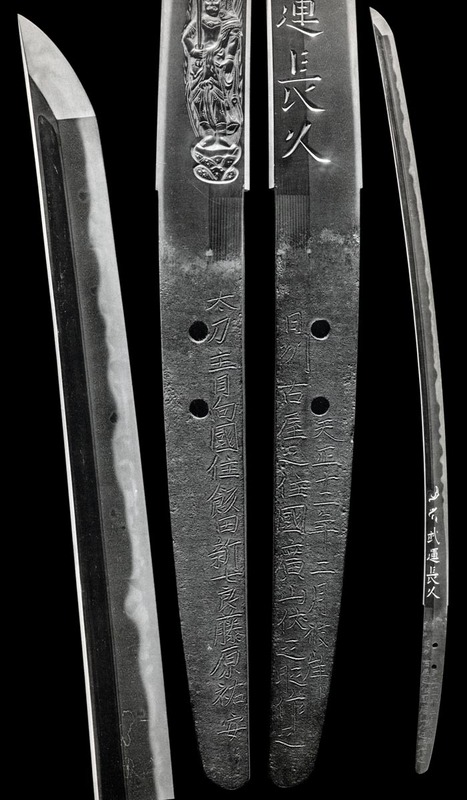 Shinogi-Tsukuri, Ihori-Mune, Sakizori to elongated Chu-Kissaki. Standing Itame Hada that is running. Ji-Nie. Gunome-Midare Ba in tight Nioi and Ko-Nie is broken apart by reaching Togari fingers and Tobi-yaki. Ashi and Yo competes with profuse Mura-Nie. Midare-Komi Boshi is beset with Tobi islands. Mune-yaki falls with the Kaeri. 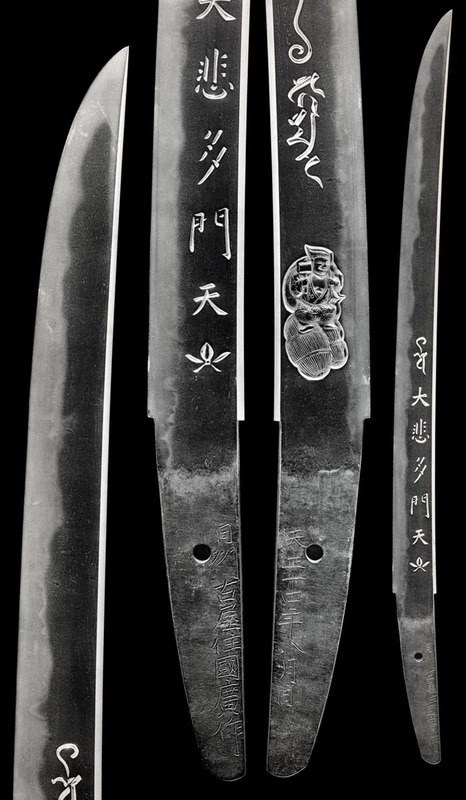 Hira-Tsukuri, Ihori-Mune, wide, thin blade with gentle Sori. Omote has a carved Jo staff. Itame Hada has thin veil of Ji-Nie. Mounding and jostling Gunome-Midare Ba with Ashi and Yo. Nioi-guchi is tight and Mura-Nie attends. Sunagashi sweeps through. High-reaching Midare-Komi Boshi where Togari turns against a long Fukashi Kaeri. .